Once a scary, science-fiction concept, robots are becoming increasingly prevalent - and relevant - in today's manufacturing settings. Robots and similar automation technologies are ideal for repetitive-motion processes that risk creating costly waste by irregular human activity. 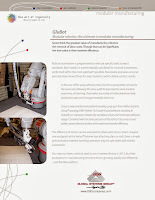 At Interzum 2013, Global Systems Group demonstrated a spray-glue robot, Glubot, that performed the task of applying adhesive to common mattress foam in a regulated, ultra-efficient pattern. 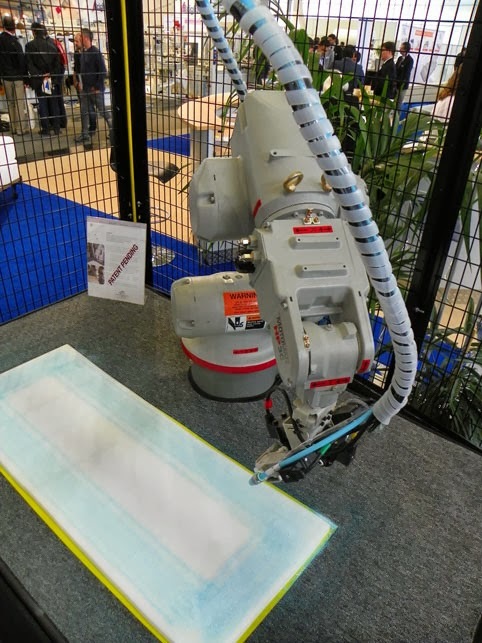 The patent-pending technology combines the unique GSG spray heads similar to the GB-1 Glue Bridge with programmed robotics for a better controlled adhesive process. See more highly-efficient mattress equipment at our GSG website and see more specialized foam-related mattress machinery as well. 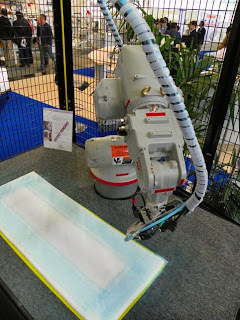 You're sure to see more industrial robots in the news in the near future, but maybe you can be the focus of that news by installing one in your factory first! ...He joined the company in 1936 and became Toyota's president in 1967 when he spearheaded a push for mass production of cars, notably its Corolla brand, using a just-in-time production system that aimed to cut waste and improve efficiency... - excerpt from IndustryWeek online article. This manufacturing visionary saw the value of cutting out the waste. He set high standards for improving processes and always sought to improve profits through improved manufacturing methods. Have you reached your efficiency goals in your factory yet? If you have, it's time to set new goals. Contact your local GSG rep to see how we can help.